At the end of 2008, The Institute for The Study of Complex Mineral Development (IPKON) built its own production facility to manufacture silicate capsules, which are used for roof anchoring in underground mines. Silicate capsules are now widely used in the world and have proven to be highly effective. The production of these products was launched based on IPKON’s own development IPKON and is unique. Numerous industrial in situ and laboratory tests conducted by the largest mining companies in Kazakhstan and the Russian Federation proved that IPKON’s silicate capsules properties can comply with the best world standards, moreover some characteristics of the capsules are superior to the cement and resin capsules currently available in the market. The use of nonflammable, inorganic materials in the production of silicate capsules makes this product absolutely safe and represents no fire hazard. Silicate capsules may be exposed to any number of thermal cycles and still do not lose their original properties. They can be used at low temperatures, which allows for their utilization in the construction industry in any season of the year. Silicate capsules can be used at very high temperatures, for example in deep mines where the rock mass temperature reaches 50 ° C. Silicate capsules have a long shelf life of up to 3 years. As of this day, there is no anchoring material which surpasses the set of properties of silicate capsules. The government authorities of Kazakhstan and of the Russian Federation issued a permit for the use of silicate capsules in Kazakh and Russian mines. 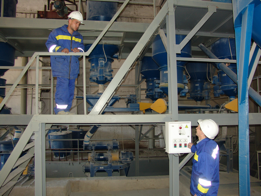 The Ridder-Sokolny mine owned by Kazzinc, one of the biggest companies in Kazakhstan, completely switched to IPKON’s silicate capsules. Specialists of Kazzinc confirm that during a 6 year period of utilization of IPKON’s silicate capsules, there was no accidents or complaints. IPKON’s manufacturing facility was wholly designed and produced exclusively in the Kazakhstani machine-building plants in Karaganda and Ust-Kamenogorsk. 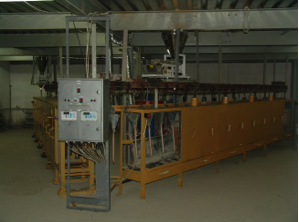 The manufacturing facility has three sections: the site of preparation of the mixture (Figure 1), prepackaging (Figure 2) and filling up. This manufacture attracts dozens of Kazakh companies as suppliers of raw materials and semi-finished products. Volumes of production can be adjusted easily. For easy installation of the anchors with IPKON’s silicate cartriges, an anchor installation machine KGA-2M was developed, manufactured and tested under industrial conditions. 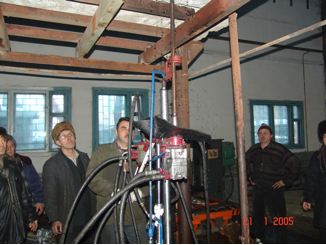 The anchor installation machine KGA-2M was elaborated in close collaboration with IPKON and the factory «Mashzavod №1». The factory made a prototype of the machine according to the technical design developed by employees of IPKON. The machine stands out from the well known foreign comparables. In other anchor installation machines, a telescopic system is used to maintain the force. The main disadvantage of a telescopic system is that at every entry into operation of the telescope, the force decreases. In the KGA-2M anchor installation machine, the force remains constant through the drilling of the hole and the installation of the anchor. The staff of the Institute continues to improve the quality of the capsules and expand the scope of their usage. 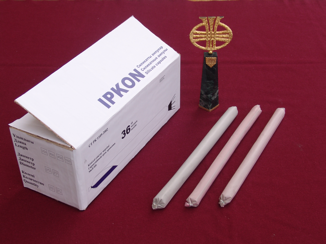 The composition of silicate capsules IPKON was patented in the Republic of Kazakhstan and in the Eurasian region. IPKON’s silicate capsules were recognized as the best invention of 2010 at the national contest “Shapagat” in Kazakhstan. An international patent application for this invention has been filed in the South African Republic. IPKON designed and built a stand for testing capsules. This stand allows to determine the quality of the installation of the anchor rod in the borehole and ensures the optimum installation of the anchor rod (notably the rotational speed and the bearing capacity). IPKON’s silicate capsules were tested in the CANMET laboratory that is the laboratory of the Ministry of Natural Resources of the Government of Canada. At the moment, IPKON is holding discussions in order to form partnerships with Canadian, Australian, South African, Russian, Peruvian and Indian companies.